Hookah bars are great fun. You and your party guests will share shisha (flavored tobacco) from a communal hookah. The hookah originated in India and is common in India and in the Middle East. If you are looking for something out of the ordinary and with an interesting cultural history the hookah bar is perfect for you. We can set up the lounge with tables, pillows and other decor will a Middle Eastern feel. 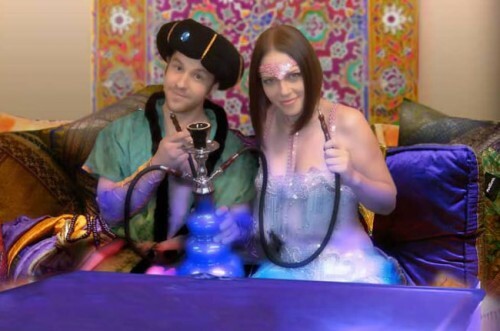 We will provide the hookahs, the tobacco, 2 harem girls, and a man dressed as a Sheikh to walk the party guests through the hookah experience. Another great thing to go along with the hookah lounge experience is the a belly dancer. Your party will be unforgettable with a hookah bar. The hookah flavor choices are: Apple, Hazelnut, Pineapple, Vanilla, Orange ,Watermelon, Chocolate, Peach,Mango, Passion Fruit, Acai Berry, Lime, Lemonade, Raspberry, Mocha, Honey, Cinnamon, Butterscotch, Cola, Rose, Pumpkin Pie, Fruit Punch, Cherry, Mint, Cantaloupe, Grape, Strawberry, Kiwi, Jamaican Rum, Margarita and Banana. We also have a non tobacco flavors. Try milk or ice in the base of the hookah. To reserve a hookah at your next party, please give us a call or fill out our Request a Quote form!